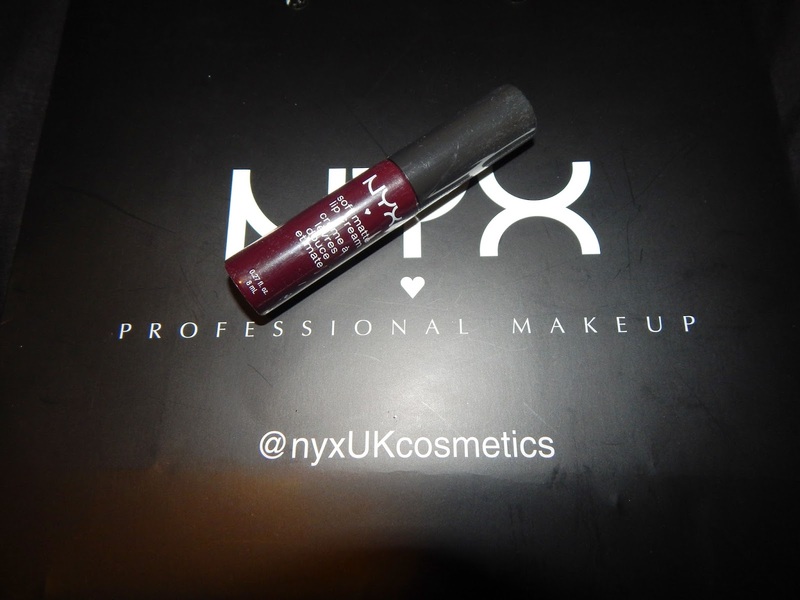 NYX Cosmetics is a brand I learnt about through social media and bloggers, I was eager to get my hands on some of the products. 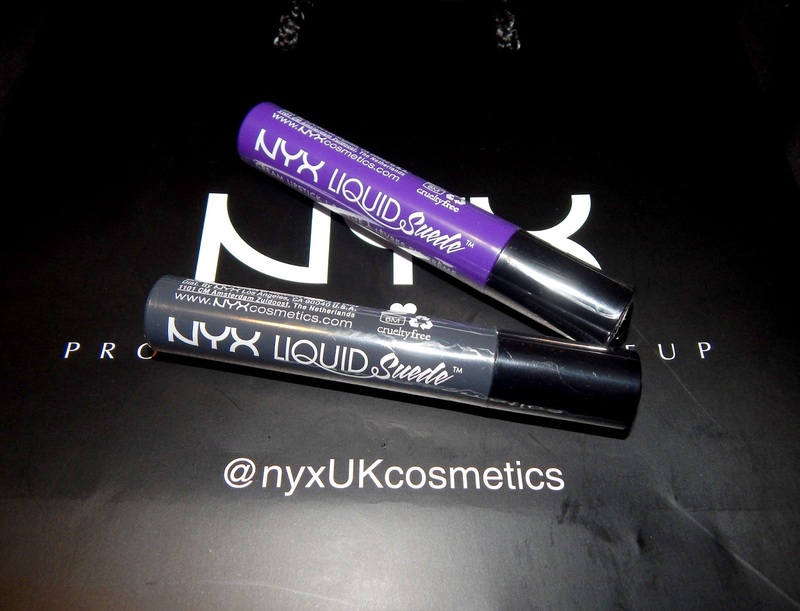 NYX now have their own stand in Boots Manchester, I went on opening week to pick up some goodies. Since I'd never used the brand before I had a good look round before buying any products, I was excited to see the liquid suede cream lipsticks in some very amazing shades. I looked at face, eyes, and lip products and beauty tools too in an excited manner as the boyfriend stood waiting for me, oops. In the end I purchased 2 liquid suede cream lipsticks, a soft matte lip cream and a satin finish black liner costing me just £22.50 and I was also able to use my boots advantage card to gain points. The Liquid Suede cream lipsticks are my favourite product that I brought, I love the coverage and choice of shades. I picked Amethyst and Stone Fox which are both bold shades but I love any purple lipsticks and the grey shade was a new choice for me. These lipsticks are priced at £6.50 each which is very reasonable, as the product is a good size and good quality. These lipstick are so easy to apply, the applicator is a long oval shape which holds enough product on it to cover both lips. I've found that the lipstick doesn't dry straight away, it drys gradually and doesn't budge when drying or being worn. Taking the lipstick off is also easy, no rubbing just normal pressure needed to take off the product. I use my Garnier Micellar Cleansing Water to remove all my makeup. The shade I chose in the soft matte lip cream was called Copenhagen which is a deep red shade but looks a lot lighter when being worn on the lips. Red lip shades are my easy to wear shade because I find that I can wear a red lipstick with pretty much everything I wear. This lipstick is priced at £5.50 so its a pound less than the liquid suede. As I just said this red lip shade looks so much darker in the bottle so I was sightly disappointed with this as I like my dark lip shades but I do love how the product is matte from the beginning. This lipstick applies matte not drys matte, it is a little harder to apply than the liquid suede but still easy enough, more coats are needed to bring the colour out evenly. My last product was a Satin Finish Black Liner which is just an everyday eyeliner, I use gel or liquid eyeliner on the top of my lids daily but wear a pencil liner on my lower lids; so I like to try out new liners when possible. What I look for in a liner is long lasting, dark colour, easy to apply and easy to remove, the NYX liner is very dark in colour and applies dark so my liner is black and it stays on for a good amount of time too. I had to reapply once during the day which isn't so bad. At just £4.00 for this product I would definitely recommend it! Lastly I have taken some photographs of the lipsticks being worn, I'm a little nervous about uploading these images as I don't tend to post images of me wearing lipstick often, I would usually swatch on my arm or hands. I wanted to try something new out for my first post of 2016 so here goes, let me know what you think. 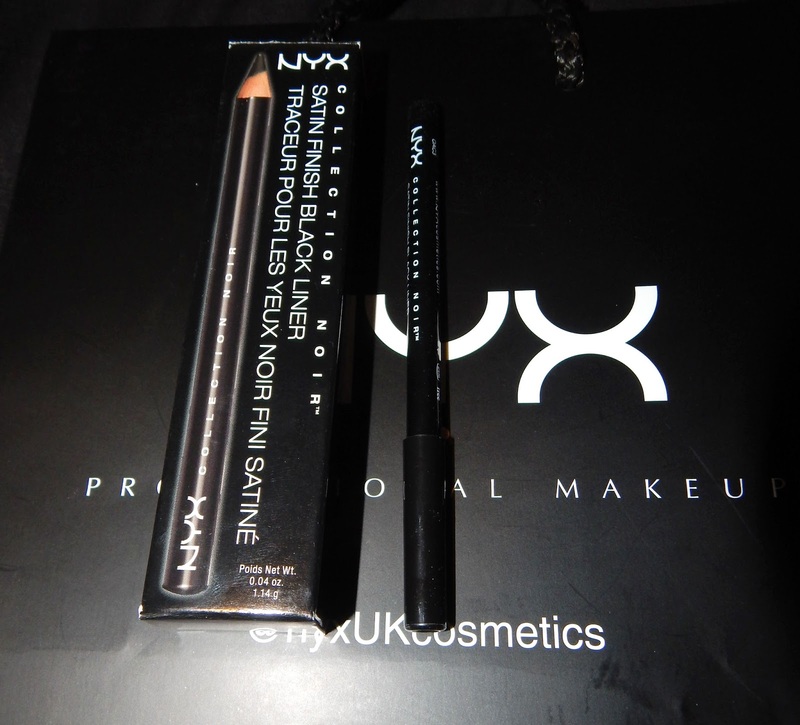 So that's my first purchases from NYX Cosmetics and I have to say I love them, my favourite items are the liquid suede lipsticks and I'm so glad that the liner is a dark black shade. I have made another order of NYX Cosmetics products from The Beauty Store so I will get another post up soon. Yeah I agree but it's still quite bold when being worn. Thanks for reading Hun.